The Prairie Falcon (Falco mexicanus) is a medium-sized falcon of western North America. It is about the size of a Peregrine Falcon or a crow, with an average length of 40 cm (16 in), wingspan of 1 metre (40 in), and weight of 720 g (1.6 lb). As in all falcons, females are noticeably bigger than males. It breeds from southern Manitoba, Saskatchewan, Alberta and south-central British Columbia south through the western United States–roughly between the eastern edge of the Mountain Time Zone and the Cascade Mountains, as well as the Central Valley of California–to the Mexican states of Baja California, Durango, and northern San Luis Potosí. It is much less migratory than the other North American falcons, but in winter it does withdraw somewhat from the northernmost and highest-elevation parts of its breeding range and spreads west to the deserts and Pacific coast of California, east to about the 100th meridian, and south to Baja California Sur, Jalisco, and Hidalgo. Plumage is warm gray-brown (sometimes called "sandy") above and pale with more or less dark mottling below. The darkest part of the upper side is the primary wing feathers; the lightest is the rump and tail, particularly the outer tail feathers. The head has a "moustache" mark like a Peregrine Falcon's but narrower, and a white line over the eye. A conspicuous character is that the axillars ("wingpits") and underwing coverts are black, except along the leading edge of the wing. This creates an effect of "struts" from the body along each wing. Juveniles resemble adults except that they have dark streaks on the breast and belly and darker, less grayish upperparts. Calls, heard mostly near the nest, are described as repetitive kree kree kree…, kik kik kik…, and the like, similar to the Peregrine's but higher-pitched. Experts can separate a distant Prairie Falcon from a Peregrine (generally the only similar species in its range) by its shape and flight style. The Prairie Falcon has a longer tail in proportion to its size; a more tubular, less stocky body; and the wing joint farther from the body. Its wingbeats are described as strong and shallow like the Peregrine's and having the same quick cadence, but stiffer and more mechanical. 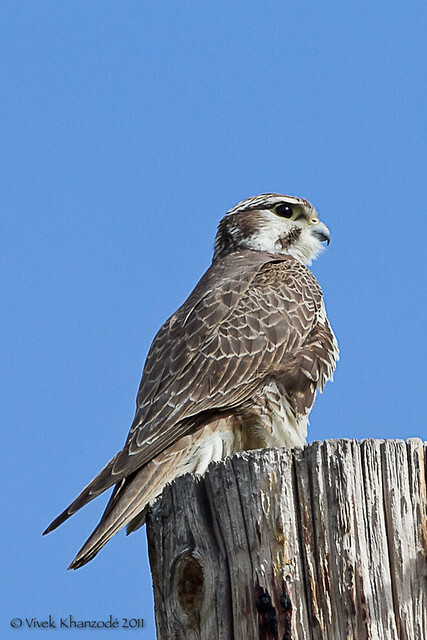 The Prairie Falcon outwardly resembles the Peregrine as well as the Old World "hierofalcons", especially the Saker Falcon. It was often considered the only New World member of the latter group. However, this is implausible for reasons of biogeography, and more recently, Falco mexicanus is considered an early aridland offshoot of the Peregrine Falcon lineage, much as the hierofalcons represent a later divergence that similarly adapted to arid habitat. Thus, the similarities between the Prairie Falcon and the hierofalcons are a good example of convergent evolution, the present species and such Old World forms as the Saker and Lanner Falcons being not close relatives but ecological equivalents. The Prairie Falcon eats mostly small mammals (especially in summer) and birds caught in flight. Like the Merlin, it often hunts by flying fast and low, at a height of only a metre or so, hoping to find surprised prey as it comes over the terrain or around a bush. Its cruising speed is estimated at 72 km/h (45 mph) and it accelerates in the chase. It also pursues prey sighted from a perch, again often flying very low. It typically catches birds by pursuing them in level flight and grasping them, less often knocking them down in spectacular dives like the Peregrine. This species nests on cliff ledges, so breeding adults are local during the breeding season. The clutch averages four eggs, which are subelliptical and pinkish with brown, reddish-brown, and purplish dots. The incubation period is 31 days, beginning with the first egg. Incubation becomes more intense after later eggs are laid, somewhat evening out hatching times. As is typical for falcons, the female does most of the incubating and brooding, and the male brings most of the food, with the female also hunting after the young are 12 to 14 days old. The young fledge from 36 to 41 days after hatching and remain with the family for a short time before dispersing. This species is often used in falconry. Although it is considered hard to train and unpredictable, it's the most popular falcon in the United States, due to its abundance and relative ease to acquire. It is also valued for its aggressiveness (observers of wild birds and veterinarians agree with falconers that it's one of the most aggressive raptors). It is sometimes hybridized with Peregrine Falcons and Gyrfalcons. The population is estimated to be stable or increasing at over 5000 pairs, with perhaps 200 pairs breeding at the Snake River Birds of Prey National Conservation Area in Idaho. ^ Earlier results that suggested the hierofalcons to be the most ancient group of living falcons (Helbig et al. 1994, Wink et al. 1998) based on mtDNA cytochrome b sequence data were in error due to presence of a numt in the hierofalcons (Wink & Sauer-Gürth 2000).